We all know that any fruit or vegetables we purchase should be washed first. It’s just basic common sense. No matter how far your food has traveled, it still needs a good rinse to wash off (at least) the particulate matter that it unavoidably accumulates. Usually the best tool for the job is a colander; just hold it under the faucet and let the water do all the work. Sometimes, however, we just want a small snack and digging out the colander (which tends to be large and cumbersome) can be an easily overlooked step. For these times, I use a folding steamer basket (you know, the one that looks like a UFO), but without any sides, food can escape and roll away (and quite often does). These Mini Colanders are perfectly suited for small-sized rinsing. Measuring just six-inches by 3-inches, the small size allows for easy storage when not in use. 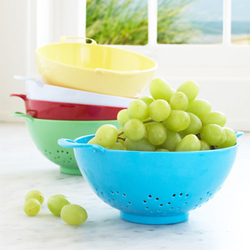 The colanders are available in a variety of colors to match any kitchen décor: white, turquoise, kiwi, green, red or yellow. Best of all, the sturdy melamine construction comes with easy to grasp handles, so it’s not only easy to store but convenient to use. My steamer basket will just have to go back to being just a steamer basket (and occasionally a UFO).